Saranap is an unincorporated area of Contra Costa County that lies between Walnut Creek and Lafayette. The Saranap Community Association is a community-service organization dedicated to improving the quality of life for those who live and work here. The Saranap Community Interest Group last month submitted to the county a list of recommendations governing future development along the commercial stretch of Boulevard Way east of Saranap Village. It includes specific guidelines regarding building height and density, affordable housing, protected views, landscaping, and infrastructure. The county will respond to these recommendations at a community meeting on Tuesday, March 19. Please join your neighbors for this important event. This could be your last chance to make your views heard on future development in this area. OCTOBER 17, 2018— The third and what was to have been final meeting of the Saranap Avenue / Boulevard Way Planning Process took place last night. Senior staff of the county’s Department of Conservation and Development presented an updated version of the draft “vision statement” they presented in May, based on input from that meeting and a follow-up online survey, as well as from county staff. The planning process was organized by District 2 Supervisor Candace Andersen and county planners to produce a “community vision” to guide future development along the commercial stretch of Boulevard Way between Saranap Avenue and the Walnut Creek city limit, just west of the freeway overpass. The final wording of the vision statement and associated policies will be incorporated into the county’s General Plan, which is being revised for the first time in 30 years. The first meeting in the Boulevard Way planning process took place last December and a second in May. A fourth will happen later this year or early next year. One of our concerns going into last night’s meeting was that the previous draft was short on critical specifics, notably the maximum height and density of multi-family housing in the area. The draft presented last night filled in those holes, suggesting a maximum height of 50 feet (55 feet with architectural features such as parapets) and a density of 40 units per acre. The typical four-story building is 40–50 feet high. Apartment buildings in the Saranap the county had figures for were all 27–30 feet high. The tallest building in Saranap Village is 55 feet tall. Apartment buildings in the area range in density from 27 to 91 units per acre, with most in the 30–40-unit range. Taken together, buildings in Saranap Village average 58 units per acre. Based on an informal show of hands, a clear majority of those in the room last night found both the proposed density and height acceptable. SIGN OF THE TIMES Two days after the board of supervisors approved Saranap Village, a sign appeared at each of the three sites showing the buildings to be built there and giving contact information. This is Site A, at the corner of Boulevard Way and Saranap Avenue. Thirty-one people spoke in favor of the development, most of them SCA members, including board members David Dacus and Charles Huddleston. The SCA had previously voted to support the project, based on community input at meetings it held that included presentations about the project. 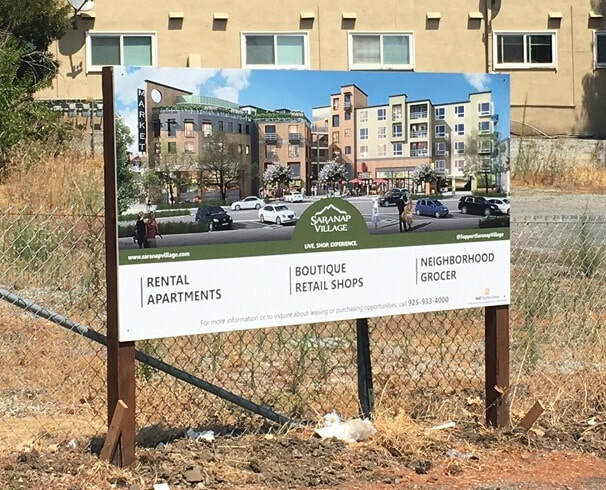 Speakers, a number of them long-time residents who live near the project site, noted that it will transform the character of a run-down stretch of Boulevard Way into a vibrant, pedestrian-friendly “downtown,” with a grocery store, restaurant, café, and retail shops. Many said they welcome the additional housing. Only four people spoke against the project at yesterday’s hearing. Their concerns would be familiar to those who have attended prior meetings on the project.